In this tutorial we'll set up oauth with Kong. Code for this tutorial can be found at: docker-kong-oauth. This repo sets up a couple things to help us try out the oauth. We're going to use a simple Django app for our user backend cause it comes with some nice user management baked in. For the purpose of simplicity, docker.local can be considered the url of the machine on which I'm running this with docker. We're going to create two upstream APIs which we'll protect with oAuth. We'll create a client application, and finally: we'll integrate our userservice so that it can be used as the oauth backend. Take note of the provision_key: 3058d5b2d6c74fcba58f439951206c4b. Ok. so now let's create out oauth backend. Imagine a news feed app. When you sign up, it allows you to authenticate with your Facebook account. From there, the app will make calls to the Facebook API on your behalf. Hopefully that will clarify what we're up to a little ..
/application/ - this is a place where client apps can register as an oauth application. End users will then give this application permission to act on their behalf. /authorize - This is where our end user gives the client application permission to access the service on their behalf .. phew. Below we will create the various views necessary to facilitate the process of setting up our oauth system. For simplicity, the kong admin integration is abstracted to oauth/kong.py. Before we do any real coding, let's create some users. We'll use python manage.py createsuperuser to quickly create two users. Let's call the: joe-app-builder and joe-app-enduser. (normally our users would obviously not be superusers .. but for simplicity, let's go with this for now). Userservice provides an interface where people can register client applications with the oauth backend. You'll be asked to login. Login as joe-app-builder. Once logged in, you get the create application page. User: joe-app-builder who has a linked Kong Consumer, which in turn has a linked Kong Oauth2 Application. Ok. So now we've got all the parts we need to start actually using oauth. Let's wire up some of the variables we need. (if you forgot what those were .. you can get them with this request: curl http://docker.local:8001/consumers/joe-app-builder/oauth2). Our client app will need these values in order to request oauth access and to generate the access_token from the access_code returned from the provider. Our docker-compose setup uses the environment.env file to set environment variables for our client container. You'll see now that the client has our client_id and client_secret. Before we click that link. Let's quickly make sure we log out of the userservice (we're currently logged in joe-app-builder). Go to: http://docker.local:8002/admin and logout (top right). Now click the Authenticate link. You'll be redirected to the userservice and asked to login. Login as joe-app-enduser this time. The two values in the text boxes are your UserService user_id, and your client_id (typically these would be hidden). .. and the userservice will perform the redirect. So, I gotta admit .. this does look like a hellova lot of work. But ultimately, it's not actually that much code. 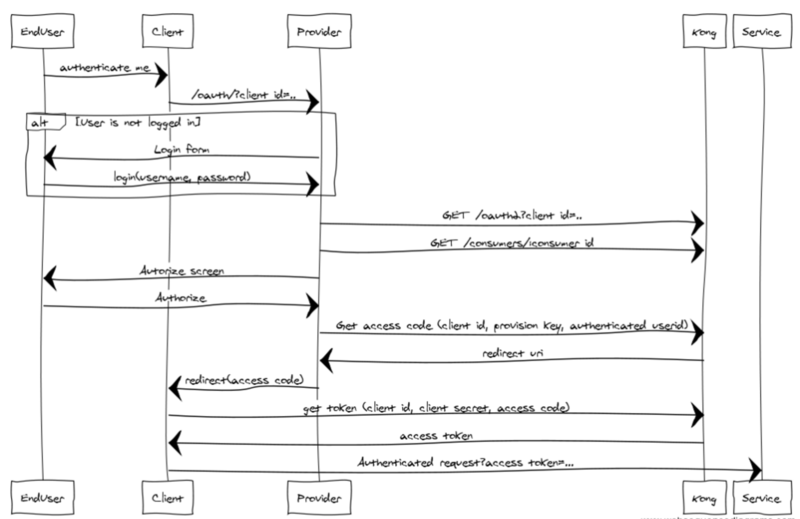 The most complicated part to wrap your head around is understanding the oauth2 flow itself, and all the actors involved in the process. There's actually not a great deal of code involved. Using Kong to handle your authentication is a no-brainer, and probably one of the biggest benefits to using Kong. The lowest hanging fruit approach to achieve authentication with Kong is using something simple like key-auth. However, this quickly becomes overly complicated. You soon find yourself needing to keep two separate data stores in sync (e.g. : your backend user authentication store, and Kong's consumer store). It also somewhat confuses the line between end user authentication and client authentication. With the oauth2 plugin these two are nicely segregated, and you can use your existing data authentication method without needing to keep it in sync with Kong. TODO: package oauth so you can pip install django-kong-oauth2 ..
Q: If I have multiple updstream APIs, will I need to authenticate against each one of them?